By JACK LYNE  Site Selection Executive Editor of Interactive Publishing LONDON -- Benjamin Franklin, that legendary Pennsylvanian wont to loft kites during electrical storms, just might light up at the idea: London-based ZeTek Power Corp. (www.zetekpower.com) - which bills itself as "the zero-emission technology company" - has decided to open a 330-employee plant manufacturing fuel cells in Lebanon County, Pa. ZeTek Power is the only European-based manufacturer of fuel cells, which generate "clean" electricity through the electrochemical reaction of combining hydrogen and oxygen. Gov. Tom Ridge announced the project at ZeTek Power's London headquarters during a stopover en route to his Central European trade mission. 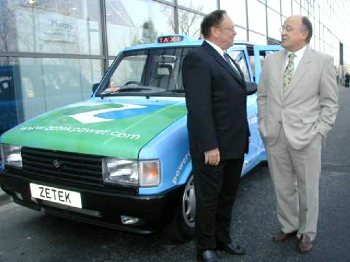 But the governor first took a ride in a four-wheel ZeTek showcase that would've delighted the endlessly inventive Franklin: the company's "Millenium Taxi," the world's only electrochemical-powered taxi, which trawls the streets of London. and Technology Gilbert Normand ZeTek's fuel cell-powered "Millenium Taxi." "This is a great way to start off our trip," Ridge said. Many other areas pursued ZeTek Power's plant, according to Ridge (who didn't name the competitors). "This company had lots of eager bidders for its new U.S. plant," he said. "ZeTek picked Pennsylvania, because we have . . . a first-class work force, a great jobs climate, a wonderful quality of life and a shared commitment to a clean environment." The Lebanon expansion marked ZeTek Power's second recent U.S. announcement. In December, it disclosed that it will open a 150-employee fuel cell plant in Oak Ridge, Tenn., using technology licensed from the U.S. Dept. of Energy's Oak Ridge National Laboratory (www.ornl.gov). Discussing the Pennsylvania project in London, ZeTek Chairman and CEO Nicholas Abson explained, "Pennsylvania is demonstrating an aggressive and dynamic approach to developing and supporting clean energy industries, and ZeTek Power is proud to be part of these activities and support the vigorous development of this program. "Pennsylvania has the right blend of experienced personnel, economic infrastructure and finance-support mechanisms to help ZeTek Power bring real industrial weight to zero-emission energy technologies," Abson added. 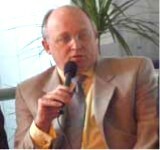 ZeTek Chairman and CEO Nicholas Abson, speaking at Hannover Fair 2001. Helping bring the project's industrial weight to Pennsylvania was a US$3.7 million state incentive package. ZeTek's incentives include customized job training, a loan for machinery and equipment from the Pennsylvania Industrial Development Authority (www.dced.state.pa.us/PA_Exec/DCED/business/f.pida.htm) and a state Opportunity Grant. As of this writing, ZeTek Power had narrowed the location of its 60,000-sq.-ft. (5,574-sq.-m.) plant to two sites in the city of Lebanon; each site is located within a Keystone Opportunity Zone (KOZ at www.inventpa.com/koz). KOZ benefits were the ultimate deal-maker for the UK-based company, according to local officials. Created by the Ridge administration in 1998, KOZs offer business locations that are virtually free of state and local taxes. By settling in one of Lebanon County's six KOZs, ZeTek Power's KOZ operation won't have to pay state or local taxes until 2013 and won't be assessed sales tax for most of its equipment and materials purchases (excepting real estate and motor vehicles). Lebanon Mayor Jackie Parker and the Lebanon Valley Economic Development Corp. (www.lebanononline.org/Demographics/edc/ecdev.html) had been working for five months to secure the ZeTek Power deal. Reading, Pa.-based GPU Energy (www.gpu.com) and Penn State also played significant roles in Lebanon's landing the project. Early on, GPU provided ZeTek with energy and infrastructure information. Now, GPU is investing through its nonprofit foundation in partnering with ZeTek's Lebanon operation. (State law requires that all public utilities establish nonprofit arms and use them for sustainable energy projects.) Penn State will support ZeTek's operation through the industrial research department at its Middletown, Pa., campus. Originally called the Zero Emission Vehicles Co., ZeTek Power initially promoted its fuel-cell stacks as a power supply for cars and boats. But with energy prices and energy scarcities soaring in some parts of the world, ZeTek has broadened into aiming for a bigger slice of the market. It now promotes its fuel cells as power sources that can supply neighborhoods, high-rises, or "even airports," according to Abson, a former British film director turned entrepreneur. The scientific principle behind the fuel cell was discovered more than 150 years ago. The technology, however, never became commercially viable, as it couldn't economically compete with conventional power generation. Now, though, the national fuel cell industry has formed its own trade organization, the fast-growing U.S. Fuel Cell Council (www.usfcc.com), and appears primed to mount a serious challenge to established power sources. "Initially, we expect to target the power generation industry, where fuel cells can help replace power generation from fossil fuels, which is less environmentally friendly," said Abson. "Within the next 16 months, we expect to show that this technology is competitive with gas-fired generation of electricity." bd0528bd0528 ©2001 Conway Data, Inc. All rights reserved. Data is from many sources and is not warranted to be accurate or current.